All around us, even on remote hillsides, there is evidence of the past work of surveyors, in the form of trig points and bench marks. Although Global Positioning Satellites can now pinpoint places quite accurately, you will still see surveyors working with theodolites in towns and in the countryside. Surveyors needed to know precisely where everything is so that accurate maps could be drawn. The most efficient way to work out the position of a place relative to other places was to use geometry, starting from one measured base line, and building up a framework of triangles across the country by measuring angles. This framework was based on places that were visible one from another; hilltops were particularly suitable. 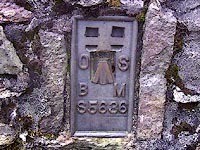 Triangulation stations are marked permanently, usually by the 4 foot high pillars familiar to walkers, though the actual point is below ground, often fixed in the rock, protected and marked by the pillar. This pillar is also a practical stand for a theodolite, whose three legs fit in the grooves on the bronze plate on top, and from which a plumb bob reaches to the point below. This countrywide triangulation was started at the end of the 18th century, and there were several later revisions. 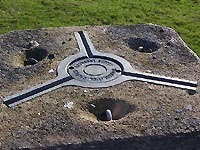 Trig points are usually shown on maps by a triangle; some shown on old maps are now obsolete and have been removed. 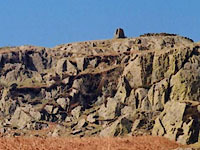 Two trig points can be found close to the boundaries of the parish, one marked by a pillar on Kentmere Pike, one at ground level on Branstree. 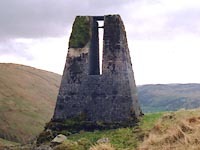 Three pillars on the eastern hills at the top end of the valley indicate the route of the tunnel carrying water from Haweswater Reservoir. The other important information recorded by surveyors about the landscape is its height. Levels were measured relative to other places, using 2 staves with height markings placed some distance apart, a telescope and a spirit level, and so the height above sea level could be calculated and recorded. This systematic levelling was started in the 1840's, and has had major revisions since then. The places where the height was to be measured had to be chosen with intervisibility in mind, they also had to be as permanent as possible, such as a trig point, a large boulder, a building, a bridge. 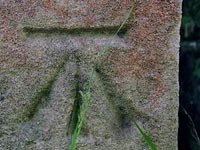 Each chosen place was given bench mark which had to show precisely where the height was recorded; the most common way to do this was by a horizontal line, with a broad arrow below it pointing to the centre. This broad arrow was a sign of royal ownership, probably dating back to when the English bowmen and their arrows were a powerful military weapon. 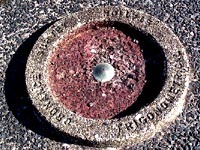 There are different types of bench mark; for example, a flush bracket bench mark had a cast plate with a serial number, and was used at strategic sites; there is one on the trig point on Kentmere Pike. 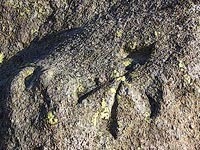 Bench marks cut directly into stone were the most common, and were often placed alongside roads and tracks. 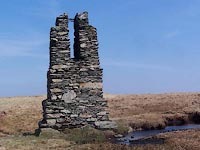 Most of these are no longer maintained but some can still be seen at various places along the valley road and the track to Gatescarth Pass.